Halifax-based heritage roofing expert, Ploughcroft, has secured a new contract to work on the redevelopment of local historic landmark, Piece Hall. The building, which originally opened in 1779 making it 236-years-old, is currently undergoing regeneration work in order to conserve and repair the building in-keeping with its Grade-I listing. Due to its protected status, a heritage roofing expert was required and as one of the only construction companies in the region qualified to complete such specialist work, Ploughcroft was able to step in. Until its recent closure for renovation, Piece Hall had long been a staple part of the local Halifax community, not only as a well-known historical landmark but also as the home of specialist shops, an art gallery and the Tourist Information Centre. Over the next few months, Ploughcroft will work to restore the roof of Piece Hall to its original glory and bring it into the twenty first century in time for its scheduled reopening in Spring 2016. There are over 10,000 stone slates which need checking for soundness and weatherproofing qualities, and the project will see this historic building transformed as a three-storey extension is added to adjoin the Square Church spire site and Square Chapel. The project is great news for the local community and will see new attractions brought to the local area. The Hall will feature a Heritage Interpretation Centre, where visitors will be able to learn about the history of the building, independent shops, cafés and a newly landscaped courtyard area, which will be used for events, concerts and festivals, as well as being an attractive space for visitors to relax. Chris Hopkins, managing director at Ploughcroft, said: “Being a Halifax-based business ourselves, we’re delighted to be working on such a well-known, historical, local landmark. “We are proud to play a part in helping maintain a building that has such an interesting local history, and the project was the opportunity to combine our two passions; heritage work, and eco roofing. 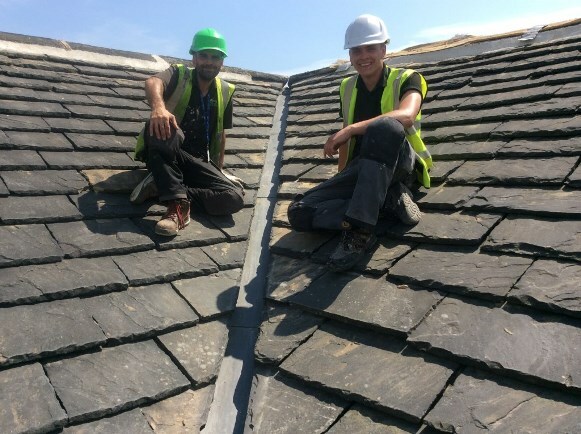 The company has recently taken on four new apprentices and thanks to the new contract that will last over 12 months, it has enabled Ploughcroft to offer an extra apprenticeship scheme in heritage slating and lead work. This will give young apprentices from around the local area a chance to learn about this specialised roofing work, learning new skills and knowledge that will equip them for their career ahead. Oliver Stock, 20, a newly hired apprentice at Ploughcroft, said: “I’ve been working at Ploughcroft as an apprentice for six months and am loving learning about the trade while on the job.